I love making this granola for my husband. Like everything else I make, it is so easy. Eat it for breakfast with almond milk (and then drink the chocolate-y milk from the bowl) or as a snack right out of the container! Spread the oats out on to a baking sheet and toast for ten minutes. 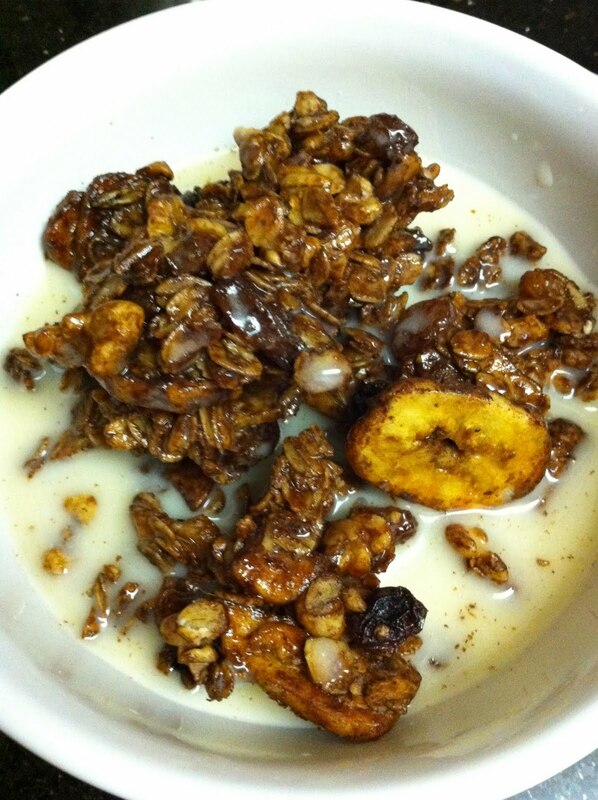 Chop the walnuts and in a big bowl, mix them with the banana chips, raisins and cocoa powder. When the oats are toasted add them in. Pour the maple syrup, safflower oil, and vanilla into the mixture and mix well. Turn out onto a large baking sheet lined with tin foil and bake for 15 to 20 minutes. Let cool and then store in an airtight container.